It’s end of May, spring is here, trees have leaves and flowers are blooming. It is a beautiful time of the year and nature provides plenty of inspiration, also for the 3D print of May 2014: a 3D printed flower bouquet. This striking and unique 3D print really is a refreshing change compared to the more technical or functional objects that are typically featured in our 3D print of month series. As their names indicates, the Drooloop (droop + loop) flowers rely on the drooping of the filament that occurs when the print head loops back and forth from the center of the flower. What struck me about the design of these flowers is that their design really explores the limitations of Fused Filament Fabrication but uses the deficiencies to its advantage: overhangs, the enemies of any 3D print, are here consciously applied as part of the print in order to form the flower petals. The beauty of this print is that it also induces an element of randomness since every flower is a unique print. This is very counter-intuitive in 3D printing where one often tries to replicate an object with the highest degree of precision possible. The source files of the Drooloop flowers are found on YouMagine under a Creative Commons – Attribution ShareAlike license. 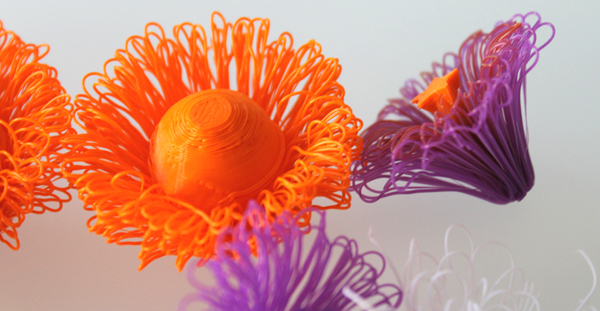 Contrary to most files on YouMagine however, the Drooloop flowers are in .gcode and not in .stl. Mark Peeters (YouMagine username: Peetersm), the designer of the flowers, has developed twenty different versions of the Drooloop such that there is plenty of variations to play with. It is probably worth mentioning that I did have issues with some of the files, which I couldn’t get to print properly. I presume there is some fault in the gcode since the printer started printing without waiting for the hot end to be heated up properly. However, as there are plenty of files to choose from this should not hold you back. 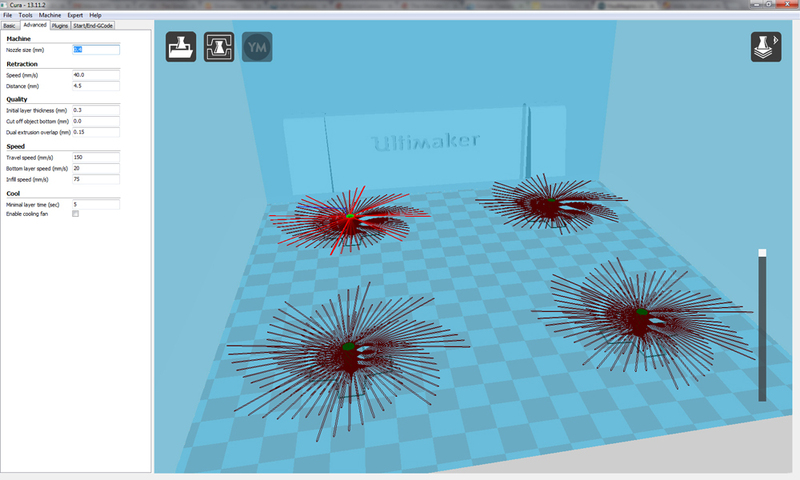 As usual, I used Cura to prepare the models for printing. For the print speed, layer height and fill density I used the settings that Mark recommends on YouMagine. Since the source file are already in gcode there is not much more that needs be done in terms of settings unless you modify the gcode directly. In fact, the reason why Mark created the Drooloops in gcode is to offer you the possibility to tweak the designs by modifying the gcode directly. This is optional though, you can print the files the way you download them, which is exactly what I did. The neat things about the Drooloop flowers is that they print fast and easy. 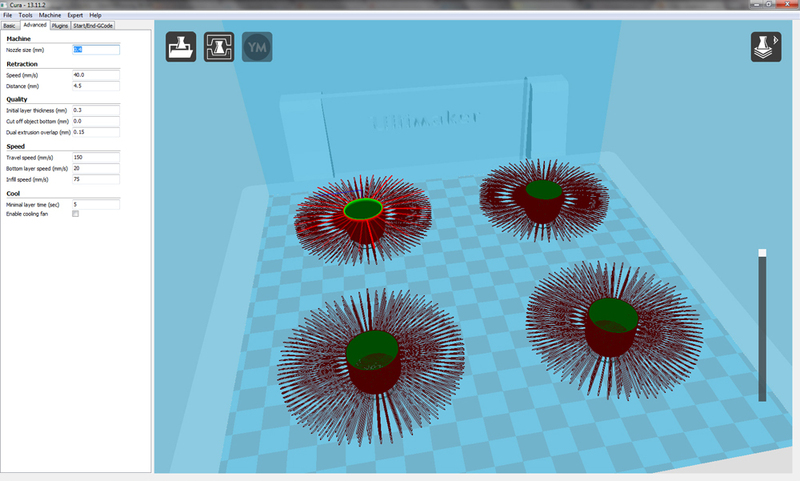 Each gcode file contains four flower petals which in total don’t take more than thirty minutes to print. As you are not looking for perfection with these prints, I didn’t bother playing around with two many settings. The default settings indicated by Mark worked just fine provided you print using PLA, as he recommends (more on printing with ABS below). You only need to make sure your print bed is properly leveled. Since the flowers have quite a small contact patch and they may get knocked of the build plate if the initial layers don’t stick well. Other than that, most of the work is in swapping the filament. Since I wanted to create a nice, colorful bouquet, I swapped the filament between every print. I explored pretty much every color I had on hand and I’d recommend you do the same. This 3D print is all about being creative! Swapping the filament actually led to some very nice dual color prints since the residual filament of the previous print got mixed with the filament of the next print. Having tried all the PLA filament variations I had on stock, I also wanted to test printing some Drooloops in white ABS. As you can see from the pictures below, this was not an instant success. PLA needs a higher temperature for extrusion but I couldn’t get the flower to print properly at 230°C. I had to tweak the temperature all the way up to 245°C before I got first results. As the pictures show though, the ABS printed flowers are not as neat as the ones printed in PLA. By my observations, ABS cools faster (even when the fan is off) which leads to less drooping hence why the results are not that great. For best results just stick with PLA. Printing the Drooloops has been a fun experience. For me, the eye opener with this 3D print is simply that the shortcomings of a technology (i.e. the inability of FFF printers to print overhangs without support material) can be leveraged to create unexpected benefits. A perfect illustration of how to make a virtue out of necessity! What do you think of this 3D Print of the Month? Does it also strike you as making a most creative use of 3D printing technology? Feel free to share your comments and feedback below.